Laura and Sven decided they wanted beautiful and natural photography at their wedding in Hamburg this Autumn. So they got in touch and we made some plans for me to fly over from the UK for their documentary wedding photography in Germany. 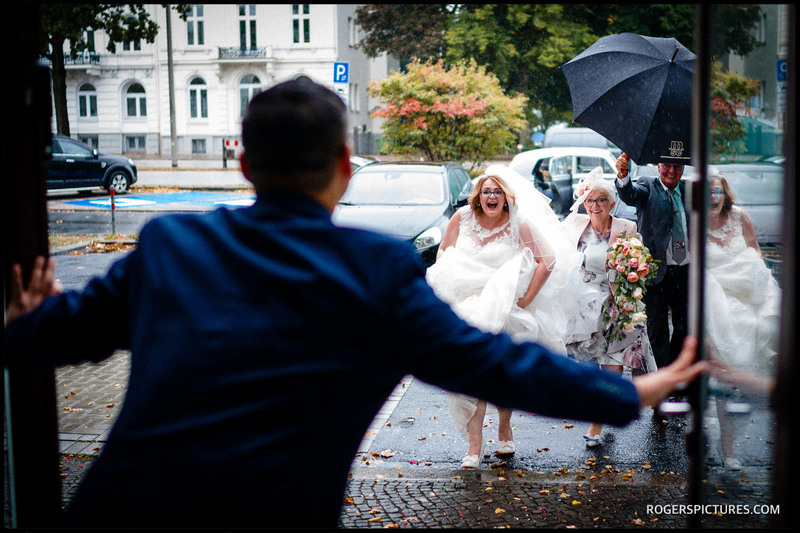 The wedding ceremony was to take place at the Town Hall in Altona, with a boat trip on the River Elbe, followed by dinner and dancing at the Louis C Jacob Hotel. The previous day’s sunny conditions sadly gave way to stormy weather, but it didn’t dampen the mood one bit! There’s nothing we can do about the weather on a wedding day, so the best bet is to plan for the worst, and forget about it. As a documentary photographer, the weather is just one more ‘character’ on the day, and I’ll try to build that into the natural coverage throughout the day. 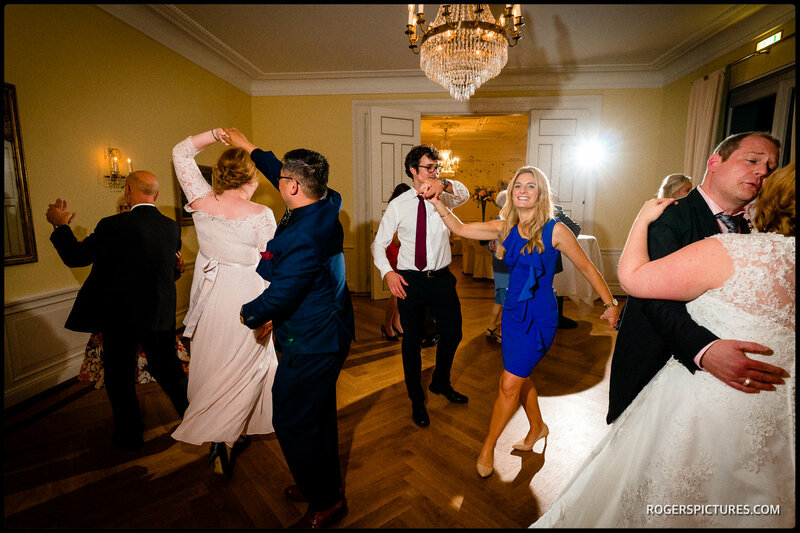 We started with Laura’s preparations at the Louis C Jacob Hotel, high above the River Elbe. I then travelled with Sven to the Town Hall where their guests had gathered before Laura and her Mum arrived in a beautiful Rolls Royce. 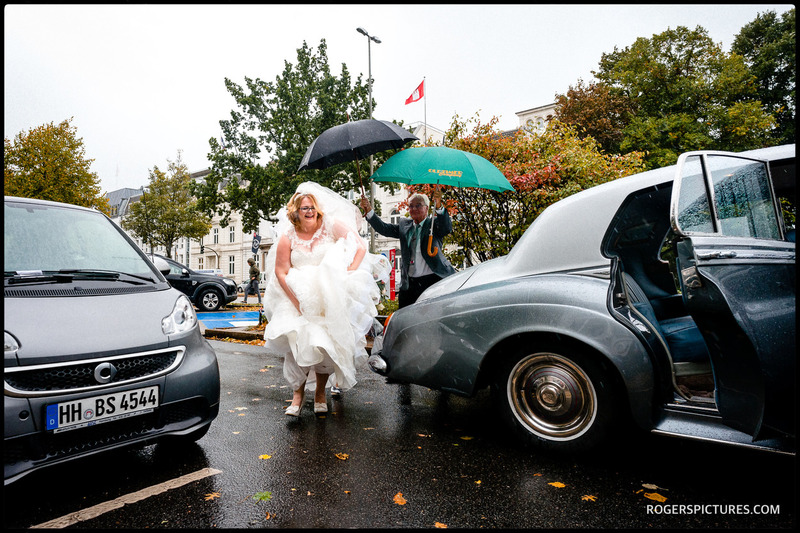 The rain arrived on cue, just as Laura stepped out of the car, and continued through the wedding ceremony. So we had a quick dash afterwards to the waiting bus for the short journey to the pier to board our river transport. Hamburg is a wonderful city to enjoy from the river, with plenty of activity and interest. We took in the city centre, docks and massive Airbus factory across from the hotel. Tea and cakes were served, before being delivered back to the pier for a rather blustery walk to the waiting bus. Back at the hotel, we took some time for some family group photos and portraits, before the guests were seated for the wedding breakfast. Some entertaining speeches led into the evening dancing, before my coverage ended. If you’re planing a wedding in Hamburg, or anywhere else, and would like me to come and document your day, here’s some information on destination wedding photography, and why it might be better to fly your preferred photographer to your wedding rather than use a local photographer. Enjoy the highlights slideshow above, and please get in touch if you’d like to know more.